Discovering giant sand dunes in Colorado was worth the effort. It wasn’t just a drive to get there, it was the trek across the landscape to get close. Starting by walking across a creek with a few inches of trickling water, visitors then walk along the dusty landscape to the dunes. 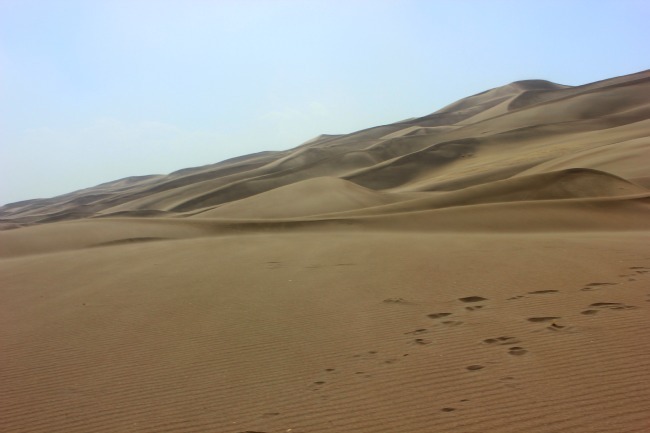 But this is no easy walk – as you head towards the mesmerizing sand dunes, looming large in the distance, the steady wind sends a continous spray of sand particles at you. The wind isn’t a gentle gust – its a constant movement of air, and those tiny sand particles are hurtled at you. They hurt! So at times it gets so bad you need to stop – turning away from the wind, closing your eyes and mouth and waiting for a break in the gusts. Then you resume, walking and walking, thinking the dunes are still so far away. But slowly, you get closer to the dunes and finally you climb up on the first one. Its not super soft, its firm beneath your feet. And when you get there, its worth it. The shades of cream and brown are changing with the sunlight. Others are there, some sitting, some standing and some trying to play – sliding down or rolling down the dunes. And the wind is still steady, your still getting pelted with those sand particles, but you get lost in the view. The size of the dunes overwhelms, and the people seem even smaller. I look at my footprints, slowly disappearing in the wind gusts. And I’m glad I withstood Mother Nature’s creativity that led to the existence of these dunes, the perseverance to withstand the elements to get close to something unique.